Download this PDF Guide for free! I know how hard relationships of all kinds can be when you aren’t emotionally aware of why others react the way they do. You are often triggered negatively by the same things (or people) over and over. You are ready to figure out WHY you (or others) react. You want to understand how to improve your relationships and create healthy lines of communication. This step by step guide will walk you through how to easily understand and shift your emotions in any conversation or relationship. By downloading this you receive a 13 page guide which includes the very steps I created and personally practice whenever something triggers me to react in a negative way. I know with all my heart it’s going to help you understand yourself better and improve your communication in your relationships! 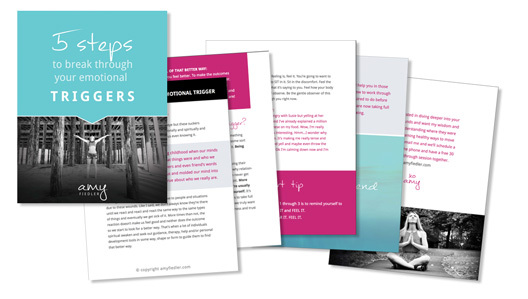 This guide is packed with examples, tips and guidance to help you mentally and emotionally improve yourself and your relationships. Enter your email below to receive this in your Inbox instantly. *By supplying us your email address you are choosing to opt in to future emails from Amy Fiedler providing you emotional guidance, mental clarity and spiritual support. You are welcome to opt out at any time by clicking unsubscribe at the bottom of the email. AmyFiedler.com is GDPR compliant.